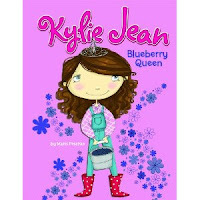 Kylie Jean ~ Blueberry Queen is a beautiful tale, written to delight and entertain with its moral and character building lessons. The book is enriching, funny and endearing to read. Kylie Jean has always wanted to be a beauty queen, ever since she was an itty bitty baby. It is her life's dream to grow up and be Miss America, she has watched the television program ever since she was two. However, for now, she'll settle on being the Blueberry Queen. The Blueberry Festival is coming up and Kylie Jean wants to enter but has no idea how. She enlists her older cousin, Lilly, to aid her and help her get her application just right. Lilly gives Kylie Jean a list and explains to her all she needs to do. The list is huge and confusing and Kylie Jean isn't sure she can do it alone. Ideas pop into Kylie Jeans head that lead her to the people she loves most in her life to help her with each quest, from raising $25.00 for the application fee to finding the perfect dress. When the big day comes, Kylie Jean is in for a surprise, which she didn't forsee, all of the other contestants, are big people. How can Kylie Jean compete? Is all hope lost for her? Will Kylie Jean become the next Blueberry Queen?? I just loved Kylie Jean, as did my daughter. We were both amazed at Kylie Jean's confidence, her tenacity and her determination. She is a little girl with a big dream and sets out to accomplish her goals. She is respectful and reminds herself throughout the book to remain so and because of her personality and charm, its easy to fall in love with Kylie Jean. I would recommend this to anyone with young ladies in their lives, you can read it to them, or it could be a starter reader for those just beginning to enjoy books. At the back of the book, you will find a glossary of terms, recipes, activities and more that will sure to keep the young ones happy. It's time for the Blueberry Festival, and everyone in town is busy getting ready. Momma's baking pies, Pa is picking berries, and me? I'm thinkin' about becoming a queen. Every year, they pick one girl to become Blueberry Queen. That tiara would look so pretty on my head - just you wait and see!